Thank you for sending so many beautiful photos. It brings us back to the amazing wedding day in Venice. Thanks again Iryna and Marco for your perfect organizing, wonderful suggestions and kindness. We wish you and your family all the best. Thank you for sending the photos,we are very pleased with them and a special thank you to you for giving us such a perfect day. The wedding meal was very good even though we had to leave our special table and join every one else on the veranda. We were entertained by a wonderful showing of lightning from the storm. We hope to return to Venice and hope that we could meet up for a drink. Thank you very much for the photos! So great! So nice! So wonderful! We are so happy for that great time in venice! All our guests were fascinated. Thank you very much for the planning! Thank you very much for the event and for the movie. We like it very very much, we cried when we watch the movie. It was very emotional. I highly recommend your services. Thank you for the champagne and for the glasses. Please send my compliments to the cameraman, he did a great job. My fiancé is very glad. We will present this movie at our wedding. My fiancé said that the bouquet was a very good idea. Nous avons été un peu long pour vous donner de nos nouvelles car nous nous sommes absentés quelques jours. En premier, nous tenons a vous remercier pour votre gentiellesse ,votre disponibilité ,et surtout votre patience. Notre séjour et surtout notre mariage se sont déroulés merveilleusement bien. Yes, we have downloaded our photos and they are fantastic. We are so pleased with everything you have done and have been telling everybody how perfect our wedding was in Venice. I must admit, I was getting tired of all of the photos and crowds in St. Mark’s Square, but when I saw the result, I felt foolish for getting impatient. Marcos and you are genius! I have been telling others considering Renewal of Vows or weddings that they MUST work with you. Many thanks again for everything to you, Marcos and Pierluigi for a superb job, attention to every detail and a wonderful experience. Thank you so much for the video. We absolutely love it. We truly appreciate you and your company for putting it together for us. We especially appreciate the way you blended the song we requested into the images you captured. That was a GREAT JOB. We have no idea of who the first two songs are by but they go well with the images of the proposal. I have not downloaded the video as of yet but we have viewed it on my cell phone. I will be heading back to the United States on Friday. I plan to download it to my server and main computer then. Cherie and I want to thank you and your entire staff for creating a memory we will never forget and for capturing the moment. I will be filling out a review on your website very soon. Apologies for not coming back to you sooner, we only landed from our honeymoon at 4am this morning. Yes, we had the most perfect day and feel so lucky we found you to help us with it. Thank you so much for everything. We have been looking at Mirco's photos this morning and couldn't be happier. He was also a pleasure to work with. He very kindly also put together a slideshow for us of some edited images. With regards to your question about the garden - it was perfect. The venue was stunning, the food and wine delicious and the staff attentive, friendly and charming. They really made our day for us. All in all, we would like to thank you so much for absolutely everything and couldn't be happier with the service you provided. nous venons de récupérer le film et sommes ravis du montage réalisé. Je vous remercie encore une fois de tout ce que vous avez réalisé pour moi et qui a rendu cette journée parfaite. La future mariée est aux anges et regarde ce film 4 fois par jour !! Thank you so much for organising our wedding. It was just what we wanted. The photographs are excellent. I’m sorry for the late response, but as soon as we got home, we had the chaos of both work and Christmas! We both appreciate your time and effort. Once again a very big Thank you. That day will always be remembered for how perfect it was. Merci beaucoup pour votre message ca nous touche enormément. On oubliera jamais ce moment c'etait magnifique, et je ne regrette pas d'avoir fait appel a vos services ! Merci encore pour tout ce que vous avez fait pour nous et j'espere qu'on aura l'occasion de se revoir un de ces jours! Bonne continuation a vous ! Nous sommes bien rentrés à Paris où nous avons repris notre quotidien... Nous voulions vous remercier une nouvelle fois pour l'organisation de notre cérémonie de renouvellement de voeux dont nous gardons un merveilleux souvenir. C'etait vraiment une journée magique! Tout était parfait ! Nous avons passé un séjour inoubliable à Venise. Merci pour vos conseils pour l'hôtel et le restaurant Vénitien le soir de notre cérémonie, c'était un vrai délice ! Venise est une ville magnifique qui nous a beaucoup plu ainsi qu'aux enfants. Tout d'abord je m'excuse de ne pas vous avoir donné de nouvelles depuis la reception du cd de photos. Nous avons eu une grosse panne d'ordinateur! Maintenant c'est enfin réparé et nous avons pu voir les photos qui sont très belles ! Merci encore pour l'organisation de cette belle cérémonie et merci au photographe pour sa gentillesse et pour ses magnifiques photos. Oui nous avons bien reçu les photos mais je voulais prendre de vous répondre mais le temps passe si vite! Nous voulions vous remercier pour tout ce que vous avez fait pour nous, vous avez permis à la magie d’entourer tout notre mariage, c'était merveilleux. Vous êtes entourée de bons collaborateurs. Les photos sont vraiment superbes, elles nous plaisent beaucoup. Le bouquet de fleurs était super, d'ailleurs il est encore beau. Bref nous avons passé un magnifique moment, et nous vouions vraiment vous remercier d'avoir été présente à nos côtés, toujours avec le sourire. Je n'ai pas beaucoup de temps en ce moment mais je ne manquerai pas d'aller très prochainement déposer un commentaire sur votre site. We have back to Shanghai, and downloaded the video, watching, laughing, being happy together, and now, we are by ourselves starting to add some chinese subtitles so that we can share video to our family also, haha, thanks millions! We love the video, and we are now very much expecting photos! все гости еще сегодня говорят только об этом и вспоминают те трогательные слова, которые вы произносили. Ужин и амбиенте были прекрасны, светящийся фантан, место под навесом было исключительным вечером было немного свежо, мы были там одни. Сервиз на выcшем уровне. О еде хочу отдельно выразить наш восторг, честно говоря мы даже не ожидали, что так вкусно будет все приготовлено абсолютно все блюда были обалденны, и этот сказочный торт он был красив, а его вкус не повторимым. Весь вечер прошел очень весело, мы там были до самого закрытия. Мы всей нашей фамилией благодарны вам, и хотим пожелать вам всех благ. С уважением и благодарностью, мы все!!! I have been very, very busy since we got back to New York and have not had the time to send a proper email to you. Thank you so much for all of your dedication and work. The entire weekend experience exceeded my expectation on every single level!!!!! I think your prices were very fair and the attention that you paid to even the smallest detail made my ceremony and subsequent event simply amazing. When I was looking for a wedding planner online, it is really hard to know what you are going get and if the pictures show a true reflection of the product. Your pictures do not do your service justice. They completely undersell your services and you are so so much more amazing than your pictures and website suggest. Thank you for taking the time to get to know me as a person. Your recommendations truly captured all of the things that I was looking to get out of the ceremony and experience. Because you took the time to get to know me, you make recommendations that enhanced my experience in ways that I could not have imagined. By trusting you and your expertise, we have the most amazing memories of our time in Venice. I know that I have not gotten the pictures and video yet, but the memories alone are worth a lifetime and irreplaceable. Thank you also for meeting us as the airport and staying with us the entire time. Not speaking Italian, I was not sure exactly how we were going to get around and having you with us each step of the way just really eased the burden of anxiety of travel and translation. We just were able to really enjoy our time in Venice and appreciate the full beauty of the city and our surroundings. Thank you for being so gracious for the mix up with payment. It was incredibly stressful not have the entire payment for you when we arrrived. Thank you for not letting that ruin our time while we were with you. The make up artist and babysitter were both amaizing as well. The tour at night and the guides were intriguing and fabulous. I just can't say enough wonderful things. Thank you again for everything. I received the package with the pictures, DVD and flash drive. Everything exceeded my expectations on every level! I loved all of the pictures. The angles and moments captured could not have been more perfect. I feel like there are hundreds of images that I absolutely love. I was beyond tickled at the way I have such a great combination of family pictures, pictures of just the kids and pictures of Louie and I together. I was so nervous to see if I was going to like the pictures, but they really turned out just beautifully. You have such a talented and professional group of people that work with you. I cannot thank you enough for all of your wonderful recommendations that were just perfect for capturing and celebrating our very special day. The locations were perfect!!!! I know it was a long day, but it was perfect in every way imaginable. Every single detail was so ideal, I couldn't have asked for the day or outcome to be more perfect. Thank you for working within my budget and helping me prioritize the things that I wanted/ needed to do to get the overall experience that I wanted. Waiting for the video and then the pictures was very exciting. Every time I opened an email or got a package from you, it was like Christmas was happening! Like I have mentioned before, working with a professional, from another country and that speaks another language can make you feel very worried. This is especially hectic when you are trying to plan a wedding over a two day period!!!! Thank you again for making everything so perfect for my day. I am sad because I know that receiving the package with the pictures is the end of our professional relationship. I feel like you are a part of my family even after such a short and very intense weekend. If you would like to use any of our pictures, pictures that include the kids or our video on your website, you have my permission. Also, you can publish any part of my email or thanks as a reference or testimonial. Please do not hesitate to give my name, phone number and contact email if people would like a reference for you or your services. Please extend the same courtesy to your videographer, make up artist, and photographer. If any of those individuals would like me to leave a testimonial or review or their personal websites, please send me the email and I would be happy to do so. Thank you, thank you, thank you, THANK YOU!!!! You are so talented and amazing and I am so happy to have had the pleasure to meet you and work with you. I really think God placed you in my life directly to give me a wonderful blessing. You are gracious, kind, brilliant and professional. Thank you for your patience and understanding during my whirlwind two day weekend. I hope life showers you with blessings and you have an amazing rest of the year!!!!! Dinner was fantastic and perfect. We had been at a wedding the day before and we could not eat all of the food they were offering. It was good that we did not sit at the titantic table as the wind shifted and it would have gotten cold out there. The wait staff was wonderful and applauded when they delivered our cake and champagne. One thing that I thought we were to receive was a card with our names and engagement date. The wait staff did not know of this. Thank you for everything. It was perfect. Merci pour votre réponse rapide. Nous souhaitons vous remercier encore pour votre aide précieuse. Nous garderons des souvenirs précieux de notre mariage à Venise. Vous et vos collaborateurs ont été très généreux de votre précieux temps! Remerciez-les aussi pour nous! Si vous venez au Canada et passez par Québec, faites nous-le savoir. Nous serions très heureux de vous accueillir chez-nous. Thank you from the deepest bottom of my he❤️rt!!! My 25th Silver Vows was truly memorable, intimate ceremony and crazy fun at the side. It is such a beautiful memory that I will live to tell and cherish in my lifetime. Thanks to you for making this happen!!! We received the pictures. They are awesome and I cannot ask for more! Am sad that this has come to an end but happy that we are able to work with you. It was such a very happy memorable Vow Renewal Day and you made it all work well! All the best with everything. Hope we get to meet again someday or if you get a chance to visit the USA, get in touch. Hello to Marco too. Great photos! Nous voilà revenus à Nancy avec la reprise du travail et tous les petits soucis de la vie quotidienne! Je voulais encore une fois vous remercier pour cette journée inoubliable auquel vous avez participé et que vous avez rendu si merveilleuse. On a apprécié votre professionnalisme, vous avez été GÉNIALE!! Le dîner était superbe! Très bon choix encore une fois!! On s'est dit avec Arno qu on retournerait à Venise dans 8 ans pour notre anniversaire de mariage mais cette fois ci sans les enfants! Thank you so much for arranging Rebecca and Ben's wedding day on Friday. The arrangements you made went perfectly and thank you for changing the timings at the last minute due to Rebecca and Ben's travel arrangements. It was a magical Venice experience. Please pass on our thanks to Dario for this kind attention and to Pierre Luigi and Marco. We would certainly recommend Serenissima Weddings if we hear of anyone wishing to get married in Venice. We are still in lake Garda it is a very beautiful place and the weather has been lovely although not quite as hot as Venice! The Reception was an excellent recommendation by you. The food and drink was to a fantastic standard and the staff ( David and Luca) were helpful and attentive. Pierluigi was absolutely brilliant! He was so wonderful with all the guests especially the younger ones- he is a fantastic addition to your wedding service. All of the guests loved the venue and its position over the Grand Canal. I feel you offered us a wonderful day for our wedding and I am very grateful for your advice, guidance and service. We have received the photographs and they are wonderful, we are both very pleased with how they have turned out. Marco did a brilliant job, thank you again for your recommendation. Hope you are well and busy with more weddings. All of the family were very complimentary about your organising and selection of the reception etc. It goes without saying we will recommend you to anyone who is thinking of a wedding in Venice. Quelle coincidence de vous croiser pres de la Fenice! Le repas de noces fut romantique et delicieux. Quel beau cadre! The italian post was super fast and the photos arrived this morning! We have to thank you again... we are very happy that we found you in the world wide web! The organisation of the wedding was perfect and communication via Mail super easy and nice! All in all it was a perfect day for us and much more better than expected! The bridal bouquet was sooo beautiful... exact what I wanted! We love the pictures <3 a big thanks to Marco! We just returned to Dubai yesterday, and wanted to thank you for making our ceremony much more pleasant and memorable than anticipated. I also wanted to thank you for the videos; and let you know that the videos you took turned out great and add so much more than just pictures to the occasion - since they are too large a file could not attach one, and instead attaching one of our pictures on the ship. Shirin & I had a wonderful vacation and were very busy all along and now need a few days to recover. Please give our best regards to our wedding officiant, whom unfortunately have forgotten his name. Hello Iryna; and hope this e mail finds you well. We have been busy with travelling since our visit to Venice, and hopefully can settle after Shirin returns from Europe next week. I managed to sort our pictures form Venice and the cruise, and put together a very nice video of the Gondola wedding. Both Shirin and I are very pleased with the result and can not thank you & Pierluigi enough, for taking beautiful pictures, videoing the event; and most importantly making the entire experience much more pleasant and memorable for us. Thought appropriate to thanks you again for all the pleasure we are going to get each time we look at the videos. I have attached a couple of pictures, and soon put a comment on your website after Shirin comes back. I want to thank you very much for all your help in arranging everything perfectly. I have downloaded the photos and everyone I have shown them to loved them very much. Sandy said I should say a special thank you for everything you did and she did not expect it at all. I want to wish you all the best for the future and would love to have you at our wedding as a surprise guest if you are available when we set a date. We arrived in Switzerland again! We will thank you for all the things you have done to make our day the most special day of our life!! We wisch you all the best and maybe see you again in Venice!!! Craig & I are so grateful to you for all your planning for our wedding and especially for your thoughtfulness and the extra work to change the day at the very last minute to suit the weather! I had a very good feeling about working with you from the very first email correspondence and it was lovely to finally meet you and spend our wedding day with you as you made us feel very special. It really was the perfect day for us and we keep remembering and re-living the day, we thank you from the bottom of our hearts and please thank everybody involved also; from the florist for my beautiful bouquet and Craig's delightful buttonhole, to Federico for the wonderful ceremony, Sabrina for the enchanting music and of course Marco for the photography, we are very excited to receive the photo CD as we have only a few photos on my phone to look at so far. Thank you also for arranging our wedding dinner, it was absolutely perfect for us and I have attached some photos for you to see. The choice of venue was fantastic and the view was stunning and exactly what we had hoped for. The food and wine were delicious and the even the flowers on our table were in our wedding colours! It was a very special evening and was the perfect end to our perfect day! We had the most incredible Honeymoon and Wedding in Venice and we will never forget 'la Serenissima' and or course Serenissima weddings and we do hope to visit again soon. We were very sad to leave such a magical place which now has the most special place in our hearts. Thank you again Iryna for making our day the most special of all days. Sean and I just wanted to send you a message to say thank you so much for everything you did on our wedding day. It was absolutely perfect, better than we expected and can't thank you enough for everything. Please let me know if you would like me to write a testimonial for your website, Id be more than happy too. Once again thankyou so much. Hope you had a wonderful Christmas and new year. Nous venons justement de recevoir les photos ce matin… Beau travail de Marco. Nous vous remercions ainsi que Marco pour ce merveilleux cadeaux qui nous replongera chaque fois que nous regarderons les photos dans ces merveilleux souvenirs comme si on y était encore… Nous allons pouvoir partager ces moments précieux avec nos familles grâce à vous. Sommes bien rentrés de Venise dimanche avec de beaux souvenirs pleins les yeux et les cœurs, avec une certaine tristesse de quitter cette ville merveilleuse. Ce petit mail simplement pour vous remercier une nouvelle fois, vous mais aussi les personnes qui sont rentrées dans nos vies à tout jamais, comme nos témoins, la traductrice, Marco le photographe, sans oublier l’officier de mairie. En effet, tout était parfait… on n’aurait pu rêver mieux. Encore un GRAND MERCI à la femme et professionnelle que vous êtes. Nous ne manquerons pas après les fêtes de porter notre témoignage sur votre site afin de conforter d’autres amoureux à vivre une semblable expérience. Quoiqu’il en soit nous reviendrons à Venise et espérons vous y retrouver. Si cela ne vous dérange pas je vous enverrai un petit coucou de temps en temps histoire de ne pas perdre contact. N’hésitez pas à vous manifester un jour si vous venez en France comme précisé nous sommes proche de Paris et serions heureux de pouvoir vous accueillir! En attendant, nous vous souhaitons de Joyeuses Fêtes de fin d’année à vous et vos proches. Nous attendons avec hâte les photos et vous embrassons tendrement. Thanks for your email. Yes i have received the photos. Loved them. Thank you very much for your efforts. They are much appreciated. I will definitely recommend yourself to my friends and family. Thanks for making it smooth and wonderful. Please let me know if you would like me to write a review/testimony on your website or anywhere. thank you very much. Merci pour cette organisation sans faille,le personnel de la mairie, l'interprète et le témoin ont été vraiment supers (félécite les à l'occasion pour nous), tout était parfait et nous sommes ravis de ce qui a été le plus beau jour de notre vie. Le photographe a été extra et trés patient avec nous, trés attentionné, professionnel. Merci à lui aussi. Tu t'es entourée d'une équipe trés professionnelle. très très bien et vraiment très très bon, soirée magique et féérique, merci pour nous l'avoir conseillé. the time after our special day in Venice was running and Lavinia and I have been full of so warm and amazing impressions of our wedding. Sorry not to write you earlier. Our special thank to you and your support in all. We had a lot of expectations to our wedding in Venice but it was much more. So all our best regards and we wish you all the best. Can I take this opportunity to thank you for making our marriage proposal the most amazing and memorable day for Pam and myself. I cannot thank you enough! Pam is still in shock. Again, thank you so much and hopefully you can organise our wedding in the future. Andrea and I just would like to say thank you so much for your help with my proposal. Everything came out fantastic and I couldn’t be more happier with how everything turned out. Everyone loves the video! It came out even better than I expected! I will highly recommend your services to everyone I know. Thank you!! Encore un grand merci pour tout ce que vous avez fait ,ce fut juste fabuleux. Le repas s'est merveilleusement bien passé également. Bonjour Iryna , merci pour votre message cela nous a fait très plaisir et nous a beaucoup touché. Nous n'avons pas encore toutes nos photos prises par nos proches, mais en voici quelques unes que nous sommes ravis de partager avec vous. La décorations faites maison, beaucoup de travail mais ce fut une très belle journée plein de magie et d'amour. Nous sommes très content de vous avoir convaincu que manger moins de viande et de poisson pouvez vous rendre en meilleur santé et donc plus heureuse. Ça fait plaisir car parfois les gens sont réticents mais pas vous . Nous aussi on vous gardera dans notre cœur car grâce à votre professionnalisme et votre cœur notre mariage à Venise restera un souvenir merveilleux. Nous avons beaucoup apprécié nos échanges avec vous rendant notre rencontre moins superficielle. Alors merci et au plaisir de vous lire. On termine en vous disant que nos familles ont trouve très très belles les photos à venise félicitations au photographe .. .
Nous voulions vous rmercier pour tout. Nous avons passer un très agréable séjour et notre mariage fut comma nous le désirions...en toute simplicité dans une ville magnifique! Sorry I was in Canada for a week and have only just arrived back to Australia this morning! We watched the video and we are so happy with it! It’s very cute and makes us miss Italy even more! You guys did such a good job, and I’m so happy that we’ll have these memories with us for life. We’d be very happy to write a positive review for you on your website or anywhere else if you like. Just let us know. Otherwise, I hope you enjoyed your holiday as much as we enjoyed ours! Nous avons reçu les CD hier : les photos sont très belles et nous ont rappelé cette merveilleuse journée. Il nous semble avoir rêvé ! L’organisation était parfaite et votre gentillesse nous a touchés. Le dîner s’est très bien passé, le menu était très bon, copieux, belle présentation, tout était délicieux. Et le service à la hauteur. Je reprends le travail ce matin et c’est dur après ces jours de rêve : encore merci pour nous avoir organisé une si belle journée et d’avoir ainsi contribué encore à notre bonheur. Tout était parfait dans l’organisation et votre présence chaleureuse nous a conquit. Marco has done amazing job. Nous tenions à vous dire de la part de tous nos invités mais aussi et surtout de nous 2, Marie et moi, que ce fut le plus beau mariage jamais vu et vécu. Vous avez répondu à tous nos souhaits et tout fut parfaitement réalisé et organisé. Nous vous conseillerions juste si vous comptez refaire une visite avec le "Dodge" qui fut très bon (et très apprécié tout particulièrement des femmes présentes) de prévoir plus de temps pour qu'il raconte aux endroits spéciaux de Venise toutes les histoires qu'il nous a offert mais en marchant à cause de l'heure du repas du soir. Sinon tout fut un bonheur complet. professionnalisme, disponibilité, gentillesse et parfaite adéquation entre les prestations présentées et celles réalisées, du premier contact à la livraison du DVD souvenir, en passant évidemment par le jour J, tout s'est toujours excellemment bien passé! Iryna fût toujours disponible pour répondre à mes nombreuses questions, dues à l'organisation d'un événement aussi important pour nous et aussi loin de ce chez nous, aussi bien par téléphone que par e-mail. Même un imprévu de dernière minute, un important retard d'avion dans notre cas, n'a eu aucune conséquence sur le déroulement de ce moment merveilleux grâce à sa disponibilité et sa flexibilité. Son organisation est extrêmement bien huilée et surtout très efficace: il suffit de se laisser guider pour réaliser une magnifique surprise à sa moitié, en toute discrétion. million thanks for your work with the wedding. We have just returned from our honeymoon. We want to thank you because everything was perfect, our families were delighted by the pallazzo, and the ceremony was beautiful. I have just received the DVD, thank you very much.. GREAT JOB..
We will happy to meet you again every time if you come in greece or in germany send me email to meet you. We would like to thank you again, for the effort that you put in organisation of our Engagement. Now, I can say that everything was the way I planed, you done everything very professionaly. I am glad, that I had found your internet homepagewhich is well done! With your help, we had moment's, that we will never forget. We wish you all the best in the future. De retour en france après un tel mariage le retour fut difficile. un séjour de rêve ,un mariage de rêve et tout cela grâce a vous. Just an email to say thank you for yesterday. It worked out perfectly and my girlfriend didnt have a clue what was going on. She was so happy and your work was wonderful. We would like to thank you very much for our unforgettable proposal. We will surely recommend you to everybody. grazie mille per splendido meraviglioso eccezionale matrimonio. We have looking at the wedding presentation from Mirco more than 30 times ! We find that so beautifull. We will like to thank you very much for your kindness, professionalism, so great organisation! It was so great experience and great souvenir! It was perfect, thanks to you! You have the eyes of the heart. You are a very closed friend to us. Many thanks for this wonderfull wedding. We will share the pictures and time spended with you in Venice in our heart for the rest of our lives as a great souvernir.It was much more perfect and beautifull as expected before! We will maybe meet you again in Venice, we hope so! Attach you can find beautifull fotos of us. We hope to see a few pictures on your site maybe one time! GRAZIE MILLE IRYNA, YOU ARE THE BEST! The walk was amazing. Thank you for convincing us to do it. It was beautiful. The dinner was delicious and the restaurant did a fantastic job. We couldn’t have ask for anything better. Also, tell the hairdresser that Shannon was very very happy with her hair and makeup! Thank you sooo much! Everything was amazing today! You did a wonderful job. We will remember this day for our lifetime and you were a big part of making it happen! We can't thank you enough. Hi Irina! It's Paula. I just wanted to thank you so much for helping ketziel with my wedding proporsal this Friday. Everything was beautiful and I still can't beleive how perfect it was! Thanks for making this moment an even more memorable one. I will forever appreciate your hard work and kindness! Thank you!! Hi, it's Ketziel! I wanted to thank you for helping me make my wedding proporsal in a very specia way. The proporsal was everything I expected and more! I am very grateful, thank you! We are crazy to see fue photos! Firstly we would like to thank you for organising a wonderful wedding day for us both - if we had to sum it up in one word it would simply be a "fairytale". Thank you so much for all you have done for us in making our day truly special. We are looking forward to seeing our photographs as the photographer was great and very creative. Would you be kind enough to pass on our thanks to him also. Thank you once again for a wonderful time and the kind gifts. Our photos arrived today - they were just perfect. Thank you so much that was just the icing on cake and the perfect end to our perfect day - we loved the photographs - please pass on our thanks to the photographer and you made our day perfect. Merci pour l'envoie des photos ,je vous dirai quand je les aurais reçues . Quand au tour des îles ,c'était très très bien . En effet il faut bien 6 heures pour bien apprécier les richesses de claques îles . Francesca a été parfaite ,ses explications ont été d'une grande aide pour tous pour s'imprégner de l'histoire de Venise ,elle a bien fait en sorte de respecter les horaires et tous ont été à son écouté .Nous avons passé une journée très agréable ,avec Francesca comme guide ,tout était bien organisé !!! Thanks once again for your help it was amazing! Below is my review which you can use on your website if you want. It's hard to believe that our wedding was almost six months ago. I told you I would write a reference for your service, but time has totally gotten away from me, but now I can sit down and write you. Thank you for all you did to plan the perfect symbolic wedding for Harry and I in Venice, Italy. The flowers were beautiful and the sparkling wine toast was wonderful. The wedding ceremony on a gondola was beautiful and we were lucky enough to have a gondolier that was wearing red and white - the colors of our wedding - and he was handsome to boot! It was a glorious and beautiful day, could not have been more perfect. The photographer and the officiant could not have been nicer or more professional. Iryna, working with you was a joy and so easy. We corresponded via email and you answered all my questions promptly. I would recommend your services to anyone contemplating a wedding in Italy. Please feel free to use our name and photos on your site if you wish. Feel free also to give my email address to anyone who would like a personal reference. Yes, they were beautiful!! we are so pleased! Euan is back in Afghanistan now but he is safe and happy. he loves the photos too! thank you to Marco for his beautiful pictures! and thank you to you for all of your help and planning! we have arrived in London and finally had time to sit down and send some emails. I just wanted to say thank you to you and Marco for making our wedding day wonderful! we cannot wait to see the photos - hopefully they are ready before Euan has to go back to Afghanistan so he can see them too! Anyway, we really had a great time throughout our journey and the cruise was wonderful too! People we met during the journey was all nice and warm! Now we are really looking forward to seeing our picture and the video of our wedding. Thank you very much for everything and I wish you all the best and your business will be continuously successful in the future too. Well, time to say goodbye and I'm sending you my hugs and wishing you all the best from Japan. Пишу тебе сказать большое СПАСИБО ЕЩЁ РАЗ!!!!! Показали фото и видео все в восторге. Некоторые наши знакомые тоже о таком задумываются. По новостям говорят,что Венецию затопило немножко? Anna and I wanted to thank you so much for everything you did to make our wedding a success!! We had a wonderful time and couldn't have done it without you! It was everything we had imagined and more, thank you so much! Thanks for everything! It was dreamy!! I never saw my girlfriend happiest!! You have my high recomendations if you want!! Hi Laura, wow! what a spectacular trip! Once in a lifetime. We had perfect weather, no rain or clouds. First of all, the suite was awesome. (I will send you pictures) We were so spoiled, laundry free, butler, jacuzzi tub, etc. I took 1,700. Can you believe it! We are still looking at them. The top for me was the vow renewal. The ceremony was so romantic and the wedding dinner on the terrace at the Europa was the best food we have had in our life. We could not have had a more picturesque setting with the Salute Church lit up right in front of our table. The company I used was so wonderful, professional, and my attendant Iryna was the best! She handled every detail beautifully. This was so much better than my first wedding!! I think that if ant of your clients are looking to do the same the should look into this company. I would highly recommend them and Iryna! Thank you again, for all your help, as I said it was a trip of a life time. We spent this weekend going through the wedding pictures. I am amazed at how many are perfect shots (it's usually so hard to get a good picture of me) we are thrilled with them. We will be blowing up several to frame. We will look at some more next week end. Can't believe how romantic and special this trip was. We are reading a roll call now on our next trip to Bermuda and on the progress of the build of the ship the Breakaway. Je suis bien rentree au Vietnam il y a quelques jours. Je voudrais t'ecrire pour te remercier pour l'organisation de notre marriage a Venise. Nous sommes tres contentes de belles photos et le super film video. Merci pour ton conseil de changer la date, enfin le solei est venu pour nous. Superbe! yes they came and I looked at them. Marco did a really good job. They are very nice and brought memories of our ceremony. You did a great job and John and I will forever be thankful. The special touches made it very special to us. Thanks again. The photos are amazing. Nos ha llegado el CD Enhorabuena a Marcos por ese excelente trabajo! muy contentos con los resultados..Bello! No existen palabras "en ningún idioma" que pueda expresarte lo agradecida que me siento por ayudarnos a cumplir este gran sueño! Después de la fantástica boda! ya estamos en casa acordándonos de los días que hemos pasado en Venecia. Antes de nada queríamos darte las gracias por todo el interés que te has tomado en que todo saliera perfecto!. Desde la ceremonia, las góndolas, el fotógrafo, la música, el oficiante, las flores hasta la espectacular cena con vistas al gran canal, todo perfecto. Nuestros familiares también quedaron muy contentos con todo. Wir haben das Video heute mit der ganzen Familie angeguckt und es ist einfach fantastisch. Die Musik und die Szenen sind einfach perfekt. Wir planen bereits das Video auf der Hochzeit selber zu zeigen. Es war ein grandioser Tag und ich will dir für alles danken was du für uns getan hast. We would like to thank you for all your help, the arrangement was perfect, and our wedding was wonderful. If you would like to have us as reference, we are more than happy to do so. We would like to have a couple of photos from the photographer to show our friends and relatives before the CD is ready, is it possible to arrange to send two or three pictures through email? And could you also ask Andrea to convert some of the photos into black and white photos and included them in the CD? Thank you once again for all your assistance. We received the lovely CD today! The album was fantastic! All the pictures are a masterpiece! We could see Andrea's is first class professional! Please forward our very best regards and outmost thanks to Andreas! And of course your professional help made our wedding the most unforgettable, romantic and like a fairy tale came true! We can't thank enough! As I mentioned earlier feel free to use our photos on your or Andreas homepage as reference! Анастасия прислала письмо, не могу им с Вами не поделиться. Хотели Вас поблагодарить за нашу свадебную церемонию в Венеции,кот была 7 августа 2012. Фотограф - мегапозитивный итальянец,корректный и приятный в общении...в общем,с ним было очень легко и приятно работать...а фотографии - это отдельная тема!!!! Ну и конечно же ИРИНА!!! Вот это мегачеловечище,без которого не получилось бы этого праздника!! Организовала все просто на 11 баллов из 10! Отдельное ей спасибо за это...Она уделила нам так много времени и внимания,я просто даже не могу всего написать(ну все 3 дня,что мы там пробыли)...Кроме этого, она нам там ооооочень помогла и выручила,там у нас случились некоторые неприятности,я даже не ожидала, что она так поможет...))) Благодарны от всей души!!!! В общем,СПАСИБО ВАМ ОГРОМНОЕ- ПРЕОГРОМНОЕ за все!!!! Thank you very much, I did receive the DVD. It's a magical DVD and we really enjoyed watching it. Thank you for memories of a life time. We are back home now from our holiday. Thank you so much for your help organising our special day, it was perfect, we are competely happy with all that happened. Also thank you fo rthe extra help you gave when it came to our package with DHL. We just received the photos and they are lovely!!! There are so many pictures, with different angles and positions. They are the best photos I have ever seen!! Please send our thanks to the photographer! We will spend a few days to look at them and then send you some that you can post on your website if you like. I received the DVD today... it's simply fantastic!!!!! What great memories they brought back to us!! Thanks again for your assistance, truly a job well done! Should be decide on getting married in Italy I will be sure to be in touch! Oui j'imagine qu'en ce moment vous devez avoir beaucoup de choses à faire. Nous tenions willy et moi ainsi que tous nos invités à vous remercier pour le super travail que vous avez fait. C'était super bien organisé ! Tout le monde à beaucoup apprécié du début jusqu'à la fin. Vous aviez raison sur toute la ligne, le galion est une expérience fabuleuse et inoubliable pour tous nos invités et nous. L'équipage était d'une extrême gentillesse et le photographe extra! L'île de Burano est somptueuse! C'était vraiment géant! La réalité à dépasse nos rêves! Comme m'a dit une de mes tantes " même une princesse n'a pas un mariage aussi somptueux! " Ce sera grave dans nos mémoires à jamais... Nous n'attendons plus que les photos avec impatience. Nous espérons vous revoir, pourquoi pas dîner un soir ensemble lors d'un de nos prochains voyages à Venise. Have recieved the package you sent with wedding certificates, DVD and photos. It was wonderfull watching the video and reliving it all again, as it was hard to take it all in on the day, it all seemed a bit surreal. Thankyou again for helping to make my dream come true. All the best to you now and in the future with your wedding planning, may wonderfull things come to you. Régis et moi tenons à te renouveler tous nos remerciements pour la journée magique que nous avons passée hier. Merci de nous avoir conseillé ce restaurant où tout était fabuleux. Le trajet en gondole était très sympathique et mon amie Sandrine et nous-mêmes te remercions pour le champagne. Traverser Venise avec Arlequin et Colombine était un grand moment et nous nous sommes beaucoup amusés. Remercie également la coiffeuse/maquilleuse ainsi que le photographe qui étaient tous deux adorables. Nous avons hâte de voir les photos !!! Contente de savoir que vous avez bien reçu notre mail. Oui transmettez également tous nos remerciements à Arlequin et Colombine en plus de la coiffeuse et du photographe (cf mail de samedi). Oui, Regis a bien récupéré copie de l'acte intégrale lundi matin. Il ne nous reste plus qu'à renvoyer notre dossier au consulat. N'hésite pas si tu as des questions sur les formalités pour les français. La soirée de dimanche était super ; c'était encore une belle surprise de Luc. Just a quick line to say that the photos arrived yesterday as you promised and we are absolutely thrilled with them. They are sooo beautiful and truly captured our emotions of the day which exceeded all my hopes and dreams. We will never forget our Silver Wedding Anniversary in Venice. Мы в восторге, потрясающе снято, отличный монтаж, прекрасно подобрана музыка, в общем, в очередной раз Ваша работа в разы превзошла наши ожидания!! Просто чудо! Спасибо Вам огромное от нас, я теперь осознал, насколько Вы были правы, говоря о том, что видео – это просто обязательная часть!! Вашему оператору и монтажеру передайте, пожалуйста, нашу отдельную благодарность! Могу честно сказать, что когда впервые написал Вам, то даже мечтать ни о чем подобном не мог, просто сказка! Ирина, мы Вас тоже целуем и обнимаем, , Вы – чудо! I'm sorry. We meant to email you when we got back to the U.S., but have been so busy figuring out engagement/wedding plans. She was very surprised and was totally in shock for at least a couple days after January 1st. The video/photos came out excellent. Everything went perfectly and we very much appreciate your help in putting this proposal together for us. We are so impressed with the photography and dvd. All of our friends and family also loved it and can not get enough of it. Thank you for everything, I hope all is well on your end. I hope all is well! I just wanted to let you know that everyone we have shown this video and pictures to have been so impressed and they absolutely love everything about it. We cannot thank you enough for setting this up for us. It is such a great memory and is truly incredible. We are still showing people the video and they are all just speechless with how great it is. We have finally chosen a wedding date, which will be October 27, 2012. If there is a testimonial section on your website or anything where we can comment on your work, we would love to write something. Everyone asks me how this idea came about and how everything was set up so perfectly without Seema knowing anything. Give our best to the musicians, and photo/videographers for all their excellent coordination! We just got back to Las Vegas and would like to thank you again for an unforgettable experience. We will write a Spanish recommendation letter and send it to you. Also, I will write another recommendation letter in English. You made our Venice wedding a truly wonderful experience and something that was better than we imagined. Please let us know when the photos will be ready. We hope you are doing well. How are things in Venice? Alicia and I are doing fine and have been very busy since getting back home. Please see the attached letter of recommendation in Spanish. We attached it as a Microsoft Word document to use as you please. We also pasted it below. We thank you again for a spectacular day! Una vez que decidimos que nuestra ceremonia simbolica la queriamos en Venecia, empezamos a buscar en el internet una compania seria para coordinar este evento desde U.S.A. “La Serenissima Weddings” fue recomendada entre muchas otras opciones. Antes de llegar a Venecia recibimos un contrato y realizamos el pago inicial sin ningun problema. El dia antes de la ceremonia nos reunimos con nuestra coordinadora Iryna para realizar el pago final y revisar todos los detalles de la ceremonia incluido el fotografo, flores, musica y paseo en gandola. Nuestra coordinadora Iryna estaba muy entusiasmada con nuestro evento, demostro profesionalismo y seriedad, lo que nos dio confianza y seguridad. El dia de la ceremonia nuestra coordinadora Iryna y fotografo Marco estuvieron con nosostros todo el tiempo preocupados de que todo salga bien, gracias a la coordinacion, experiencia y profesionalismo de Iryna nuestro dia especial fue increible e inolvidable! Con afecto y gratitud recomendamos “La Serenissima Weddings” son muy profesionales, serios y confiables. Gracias a nuestra coordinadora Iryna y a su equipo de trabajo… nuestro sueno se hizo realidad! Nous avons envoyé tout les papiers pour la transcription hier. Nous voulions également vous remercier. Mon mari a été très content de votre prestation. Il a passé une journée extraordinaire !!! Et moi aussi, c' était magique.Tout s' est bien passé et pour cela un grand merci. Nous garderons toujours un excellent souvenir de cette journée et de cette ville surprenante!! Merci aussi à notre photographe et à votre coiffeuse qui est très très professionnelle. Je regrette de ne pas avoir écrit son adresse pour aller la revoir en cas de nouveau voyage à Venise!! Remerciez-les pour nous et encore merci à vous ! Mon meilleur souvenir sera le moment avec les pigeons!!! Pour notre grand plaisir, nous avons reçues les photos hier. C’était une grande joie de revoir cette journée. Je devais vous envoyer un message mais nous avons été très occupé. Tout c'est très bien passé, l'accueil du serveur très très sympa, le restaurant .... Le gâteau bref tout était parfait. Merci pour tout Irina nous avons passé le mariage que nous avions rêvé. y porque fuera tan bonito y tu tan simpatica. Estamos muy contentos con las fotos. Gracias Iryna, quizas nos volvamos a ver para algun aniversario. special. Every detail was organized and planned. We appreciated all of your hard work. making beautiful photos. Please tell the photographer how happy we are. We are so happy you helped us. Please use us as a reference for future clients. We wish you continued success and happiness. I attached a photo of all of us! I love it! belle foto. Informi il fotografo quanto siamo felici. Siamo cosi felici che ci hanno aiutato. Si prega di utilizzare noi come riferimento per futuri clienti. Ci auguriamo di proseguire il successo e la felicita. Everything is OK.We received the church documents and all photos and video. We are very satisfied from your work and thank you that you recomended to us Mirco the photographer we are in love in his photos.He is amazing!!! Nous voulions t'écrire plus tôt, mais nous nous sommes laissés entrainer par la reprise du travail. Quel souvenir! Quel mariage! Un grand merci, tout était magique, surréaliste, du palazo cavalli aux derniers instants passés ensemble SIGRID & Moi continuons à ne pas y croire. Nous t'embrassons trés fort et espérons te revoir. Le diner à la TERRAZZA était parfait, les gens de BONVECHIATTI, le service et le repas à la hauteur de nos espérances. Nous avons fêté notre mariage dignement. come stai? spero tutto bene! Sigrid & moi sommes toujours en train de parler du mariage et de cette magnifique journée. as tu eu des nouvelles des photos? Nous aimerions tant les recevoir pour revivre tout ça. ça y est nous les avons reçues, nous sommes trés contents, tu remercieras le photographe de notre part qui a fait lui aussi du bon travail. nous espérons avoir de tes nouvelles. tu es la bienvenue en france. De retour en Belgique, nous voulons encore une fois vour remercier pour cette magnifique après-midi. Nos têtes sont remplies de souvenirs fantastiques. Nous avons tout reçu, merci. Les photos sont fantastiques, avec elles le bonheur continue! Tout est merveilleux! Encore un grand merci et bravo !!! Tout d'abord, MERCI pour l'organisation de notre mariage qui fut exeptionnel. Nous n'oublierons jamais tout ce que vous avez fait pour nous car grace à votre travail ce moment a été magique. En effet, nous n'avons eu qu'a profiter de nous et de notre mariage. De plus, la coiffure, le maquillage, l'interprete et le photographe ont été super. Enfin, nous sommes heureux de vous annoncer que suite au mariage Stéphanie est tombé enceinte et donc nous attendons un enfant. Thank you so much for all your help yesterday and through all the planning of our wedding ... We had a day to remember, it was marvellous .... Molto brava to you !!!! I’d like to thank you again for all you did to make our wedding so enjoyable. We had a great time in Venice and on reflection don’t think we would have changed anything. I’d like you particularly to pass on our thanks to the restaurant. The food was great but the service was excellent, everyone was friendly and went out of their way to make it an occasion for us. j'espère que vous allez bien. Après Venise nous sommes partis à la mer , côté Atlantique. Nous avons apprecié notre séjour à Venise , la ville est très jolie, l'ambiance inoubliable.Surpris à chaque coins de rue par la beauté des lieux. Nous avons eu un mariage romantique, simple mais profond. Un grand merci à vous c'était vraiment très bien . Francesca et les témoins étaient très sympatique . Le restaurant était très romantique c'est géniale. Le photographe était très gentil et on a bien rigolé. Hi! We are back home, all is well and we are very happy. How are things with you? We had an excellent time in Venice and LOVED our wedding ceremony. and we would love to keep in touch. We would also like to have your mailing address as well. Thanks! Please say hello to Federico and Marcos and we look forward to hearing from you soon!!! I'm very impressed by the pictures, they are amazing! Please express my gratitude to the Phographer, he made the pictures very professionable and all of them are very nice. I will find time to write my compliments to you and your company on your web-site. 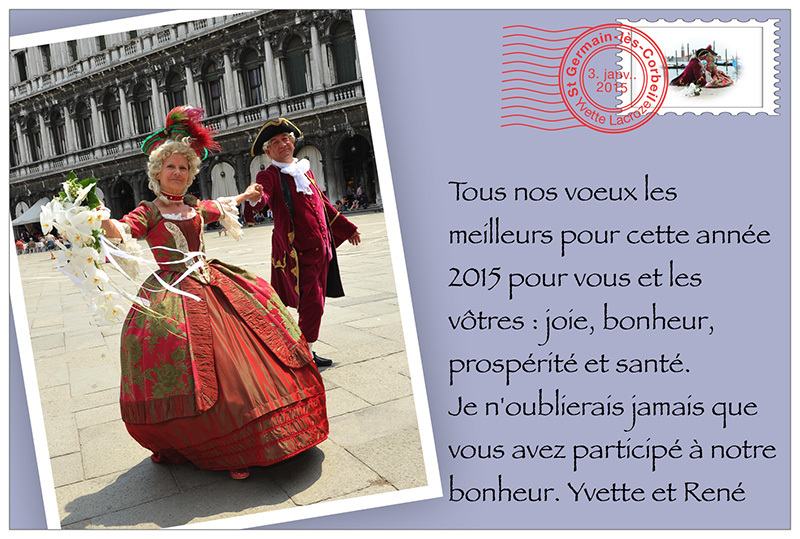 Petit message pour vous remercier de vos services ! MERCI pour tout , on est enchanté de notre sejour et mariage à Venise !!! Ce sera un souvenir inoubliable pour nous . On attend plus que les photos...on est impatient de les avoir !! On a reçu nos photos ! On est heureux , c'est très beau ! Merci pour TOUT ! On a été entièrement satisfait de vos services. das essen im europa& regina war sehr gut. They (pictures) are so beautiful! Thank you again for all your work! The day was beautiful and we couldn't have asked for anything more wonderful! Notre repas à La Terrazza était très bien! Le mieux c'est soit d'arriver à l'ouverture pour manger directement ou bien pour réserver pour avoir une table au bord de l'eau. Nous avions donc réservé et nous avons très bien manger! de plus, le service était impécable. Nous avons été très contents. Il nous tarde de recevoir le disk pour voir les photos !!!! D'autre part, nous aimerions poster un gentil commentaire sur votre prestation, comment faut-il faire ? A l'occasion de notre mariage civil à Venise, nous avons vécu quelques heures comme dans un rêve, avec rien d'autre à nous soucier que nous-mêmes. Tout était si bien organisé que nous avons pu profiter pleinement de tous ces petits moments magiques concoctés avec soin par Iryna de Serenissima weddings, avec en plus quelques surprises qui n'étaient pas prévues au programme, comme la marche nuptiale entonnée par l'orchestre du Caffé Florian ! De la mairie à la place San Marco, en passant par la gondole, nous garderons de cette journée d'inoubliables souvenirs. Encore merci pour tout ça ! We appreciated very much that ceremony and would like to thank you again for your professionalism. Merci pour cette journée inoubliable pour notre mariage. Ce fut une journée magnifique, tout était parfait. Le diner etait magique. Le lieux, le personnel, la qualité et la diversité des plats etaient parfaits. Vous avez tres bien choisi. Merci. On attends maintenant avec impatience le travail de Marco. On va surement utiliser ses photos pour nos remerciements. We would just like to thank you for all your hard work in putting our wedding together. We thought that having our wedding in venice would be very difficult to organise, but because of you we were able to have our day just the way we wanted. We thoroughly enjoyed every part of our day from the service to the reception on the galleon, the whole day was perfect and very special. Everyody who attended the day commented on how wonderful everything was, which was largely down to you. Mr and Mrs Thayre, U.K.
Nous avons bien eu le film à l'hôtel, il est magnifique.Merci beaucoup pour ce moment inoubliable et très émouvant, c'était parfait !! Everybody in holland( family and friends) they all found it fantastic. We have got a lot of compliments about the way of filming. We would love to have the music of the video. So we can use it in the church for our wedding. je t'écrirai lorsque nous serons complètement rentré chez nous. Dear Iryna, We do want to thank very much for a perfect day for us!! It all went beautifully and yes, we have received the DVD of pictures. Very nice! Thanks again for everything! It was all great, from the gondola, the minister, the musician (Diego), the photographer and photos, flowers, etc. Exactly how we hoped it would be! Thanks again!! Iryna, Nous sommes rentrés de vacance ce dimanche avec des souvenirs trés heureux de notre mariage. Nous nous attendions pas à une organisation aussi parfaite. C'était merveilleux, un vrai conte de fée. Merci Iryna nous faisons des éloges de vous. Les photos sont magnifiques !!! On va vite les montrer à notre famille. Je vous remercie de nous avoir rendu aussi heureux, nous ne sommes pas prés d'oublier cette merveilleuse journée et votre grande gentillesse (et votre patience aussi). Iryna..... WOW !! What an amazing job you did on our wedding day, I just received the video and photos they are OUTSTANDING...... My wife has not seen them yet, I know she is going to be thrilled with the way you put it all together. You really made this a special day and I'm sure we will be able to enjoy the video and photos for many years to come! Your the best. Dear Iryna, Nupur and I just got back to Delhi after traveling for the last couple of weeks and saw the dvd as soon as we could. IT WAS PERFECT!!! There are no words that we can use to describe how beautiful we think the video turned out and there is no way we can describe how we felt watching the DVD. To be able to re-live that moment for us is simply magic! I can never forget how surprised she looked that day and thanks to you I will always be able to watch it over and over again. I seriously never expected the video to be this amazing but both of us are in shock at how each and every moment has been brilliantly captured on tape. We have already seen the video about 15 times and still want to watch it again. We have shown it to both our parents and even they can not believe how wonderfully it was prepared and how smoothly it was done. Once again, both of us, thank you from the bottom of our hearts. You have blessed us with memories that will be sure to put smiles on our faces for the rest of our lives. I truly hope that we get the chance to thank you in person the next time we are in Venice. Iryna, We just retuned from our Vacation in Italy and the time we spent in Venice was the best by far! Thank you so much for helping me out and making the proposal so memorable. It went exatly as I had hoped for and am so pleased with how it turned out. Thanks so much for sending the pictures too. They turned out great. We realized we didn't have any pictures of the occasion so it was so nice to come home and find that you had taken some and had taken the time to send them to us. Thank you again so much. Best Regards! Hi Iryna !! We got the weddings pictures and we are very excited, they came out fantastic, we are extremely pleased with them !! He really did an awsome job so both me and David are very very happy with his job. You should put a few on your website ! I am enclosing a few emails i received from other companies when i was looking for a wedding planner in Venice as you requested. Thank You very much for making it all happen. We are happy with the results and have great memories of Venice. It has been a pleasure to meet you and to do business with you. Thanks again !!!! Здравствуйте Ирина, Все прошло великолепно, мы всем очень довольны. Спасибо Вам огромное за замечательный праздник. Iryna, Kelly and I would like to thank you from the bottom of our hearts for your work in putting together an unforgettable Venice wedding. You truly made our wedding day very special and very easy on us….we definitely couldn't have done it without you!! If for some reason we miss you tomorrow when you drop off the pictures please check with the Concierge as we will be leaving something for you there. Уважаемая Ирина Мы уже дома, провели незабываемые дни в Венеции и Флоренции. Спасибо большое за огранизацию такого праздника для нас. Фотки просто прекрасные. Мы уже получили диск, просто нет слов превосходно.Большое спасибо от всех наших. Ирина, здравствуйте!!!! Мы с Сережей хотим Вас от всего сердца поблагодарить за помощь, которую Вы нам оказали. Этот день( хоть я и нервничала так сильно) мы запомнили таким радостным и красочным! Сегодня я получила свидетельство и фильм. Спасибо Вам огромное!!!! Я просто в восторге.Сережа еще не видел,а я прямо на работе смотрела... все очень красиво! Спасибо Вам за этот прекрасный день. Bonjour Iryna, Nous avons bien reçu le DVD de photos. Nous sommes très content de la présentation et du résultat des photos. Merci beaucoup pour tout et très bonne continuation dans le beau métier d'organisatrice de mariage. Dear Iryna, On behalf of Mike and I, I just want to thank you so much for arranging the most perfect wedding day!!! The day was more perfect then either of us ever expected, and that is down to you, and the fabulous job you did!. Everything from the perfect wedding bouquets, exactly as I had asked them to be, to a lovely hairdresser, to an amazing location for afternoon drinks, to the fabulous, and perfect restaurant for our evening meal!, it was just perfect!!!!! All of our guests were utterly impressed with the day, and it ran so smoothly, I even think you had a hand in the exceptionally good weather we had!!!! Just an extra word about La Caravella. It was excellent! Nichola was the perfect host. He was so professional , and attentive, he looked after us so well on the evening, and the food was amazing!!! Thank you so much for suggesting this restaurant, we would never have had the perfect day we had if it wasn't for you. Thank you again, so much. We would be so happy to recommend you to anyone else, and if we can ever provide any form of reference for you, we would be happy to do so. I have attached a few of our own photo's for you to take a look at. Thank you once again, we will always remember the important part you played in our wedding day with much fondness. bonjour iryna, nous sommes de retour a bordeaux ou le temps est magnifique mais il manque le charme des gondoles...merci pour cette journée de mariage nous avons passés un moment magnifique et vous avez était très sympathique. bonsoir nous avons reçu les photos aujourdh'ui ,elles sont superbes mais ne passent pas toutes verticale,c'est un peu dommage.Encore merci pour cette journée inoubliable..et au plaisir a bordeaux. Thank you for taking care of our special day. It was truly very memorable! We can't wait to see the pictures. Все получили! Только вчера дошли и диски и свидетельство. Ирина - Вы настоящая волшебница, а наша свадьба просто сказака! Именно таким хотелось видеть наш праздник, романтичным и только для двоих. Приятные сюрпризы от компании "Serenissima" радовали на протяжении всей свадьбы! Огромное спасибо фото- и видео операторам, ребята вы профи! Несмотря на сложность съемки и на воде и на суше фото и видео великолепны. Во время церемонии за нас искренне радовались наши свидетели, хотя мы их видели впервые, это было очень приятно. Ирина, Вам отдельное спасибо от наших родителей. т.к. за нас все очень переживали. Вся свадьба прошла в атмосфере шика и всеобщего признания. Свадьба в Венеции - это супер! У вас дар делать праздники! Какой же у вас классный видео оператор! Нашу свадьбу смотрим по три раза в день =) Супер съемка и музыка подобрана отлично! and see the genuine joy you get from making peoples dreams come true. We will always be grateful to you and will keep in touch. Many thanks! We wish you every happiness. are beautiful, really professional and we were glad to find 300 of them. So thank you and please pass on our thanks to Marco please!